Betfair Poker is one of Europe's leading poker rooms with a team of pros you can learn from and play against. The tables are always packed with action and the pros are always there to watch and help. Betfair Poker offers you the most popular poker games today: Texas Hold'em, Omaha, Omaha Hi-Lo and Seven Card Stud. 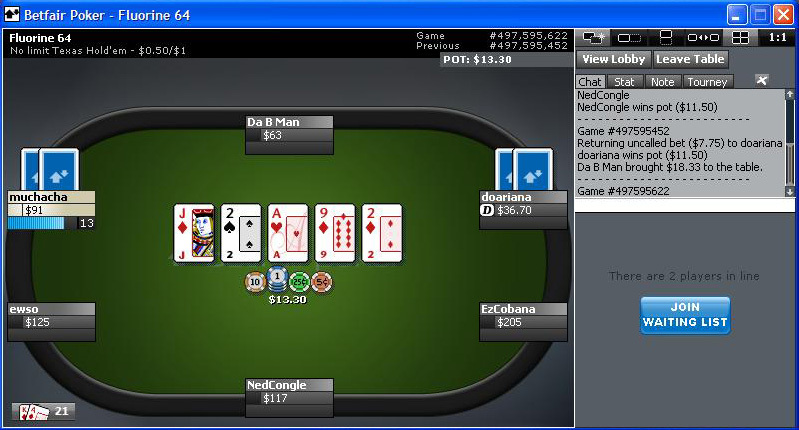 There are beginner tables as well as standard tables, so you can find a poker table according to your game level. 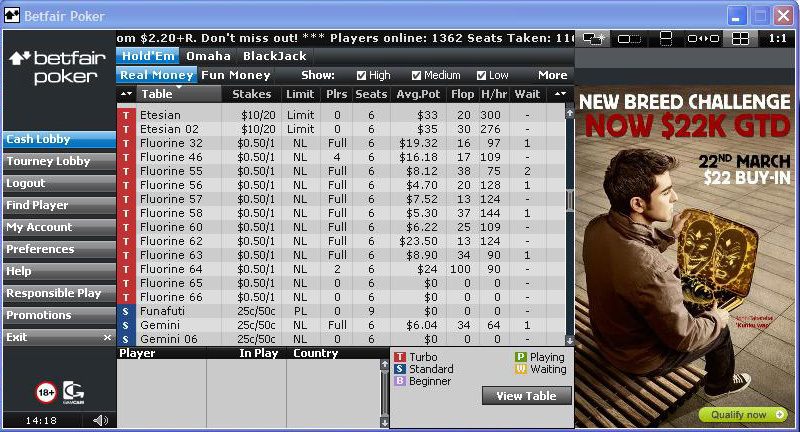 You can also find Turbo tables, if you wish the action to be a little faster and the poker game to be more challenging. The stakes range from $0.02/$0.04 at the beginner tables and up to $1,000/$2,000 at the Turbo and Standard tables. The number of seats in the tables range from Heads-Up where you play against a single player for the entire prize pool and up to 9 players in a table for full action. Deposit Options: Visa, Mastercard, Delta, Solo/Maestro, ClickandBuy, Neteller, Moneybookers, bank transfer and check. Withdrawal Options: Debit/Credit card, Neteller, Moneybookers, bank transfer and check. Support is available by e-mail, telephone and even live chat through the site. The support team is very kind and professional. Betfair Poker has a variety of tournaments to offer, so it's never boring in the tournaments section and it's always packed with players competing for the big prize. You will find the $11,000, $20,000 and $80,000 Guaranteed prize money tournaments, Satellites to poker's biggest events such as the BPPT Estoril and the Irish Open, freeroll tournaments with an opportunity to win real cash, Rebuy tournaments, Deep Stack tournaments, plus much more. The buy-ins range from $0.01 only and up to $310, so there is always a tournament waiting for you with the right buy-in. Betfair Poker offers you up to $600 signup bonus. You receive your bonus in increments of $10 each time until your entire bonus is cleared. - Annette Obrestad ('Annette_15'). She is the quiet Norwegian with years of poker experience both online and in live tournaments, and she showed that by winning the WSOPE when she was only 18 years old! - Sorel Mizzi ('Imper1um'). This Canadian pro has won over $1,000,000 in 2008 only. - John Tabatabai ('kunku wap'). Don't let this guy fool you. Meet him face to face and you can trust him with your money, but at the poker table trust only yourself. - Peter Jepsen ('PeterJepsen'). This poker pro has won $499,000 online in less than a minute. - $10 Max Fee on all tournaments. The house fee has been cut to $10 on all SNG and MTT, so now you will get more value for your money. - Bankroll Booster. This is your chance to build up your bankroll for free. Every week, 100 players will receive real cash for free and without spending any money. - Betfair Leaderboards. Become a Betfair leaderboard to win big prize pools and a lot of cash. ($10,000 Lower Stakes MTT Leaderboard, $10,000 High Stakes MTT Leaderboard, $27,000 SNG Leaderboard and more). - $55,000 Guaranteed Tournament. It happens every Sunday and you can enter this tournament directly or through daily freerolls. - Guaranteed Tournaments. Betfair Poker offers seventy Guaranteed Tournaments every day. - POKERFECTA. This is a great and challenging feature. If you will be able to win three MTTs in one week, you can win a WSOP Europe chipset, a Betfair fleece jacket and a Betfair cap. To a whole different topic now, we here at ViewOnPoker.com want to offer you also the best and top Christmas toys 2011 for great prices so your kids will be happy and enjoy their new toys as well as allowing you to save some money for other activities this holiday.